Power to go! There are times when all of us want electricity when we are miles from the nearest electrical outlet. 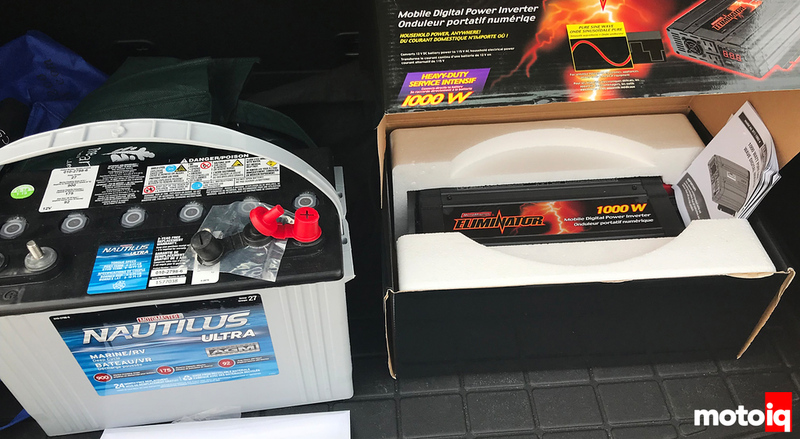 Two key components to having power on the go are a mobile digital power inverter and then a battery. Ideally, a deep cell battery will handle the constant drain and recharge that you’re going to be subjecting it to. What motivated us to investigate this DIY project was the desire to have an ongoing electric power supply in the event of a complete system outage. Though the want to stay connected while on-the-go was also a motivating factor. Whether your electric needs are driven by your desire to update your social accounts at all costs, or be able to run a small compressor to quickly pump up a flat tire during the apocalypse, you can’t deny that a mobile electric power station doesn’t sound like a great idea! There is a wide range of solutions that will cover many short-term electric needs and requirements. Obviously many modern devices have their own battery power supply, but if you are off-grid long enough then you may need something more substantial. You can always use a small power inverter that plugs into your car’s power supply, but that puts you at risk of draining your car’s battery. That could leave you completely stranded! Depending on how far away you are from civilization it could lead to a far more difficult situation. 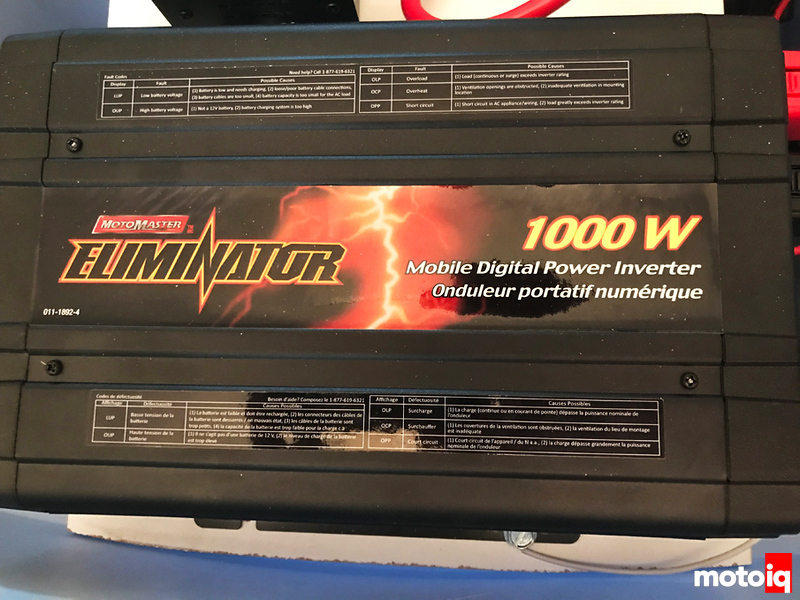 This 1000 watt inverter is a pure sine unit. If you are using delicate equipment – believe it or not that includes a lot of batteries in handheld tool battery packs – then a pure sine wave inverter is what you need. 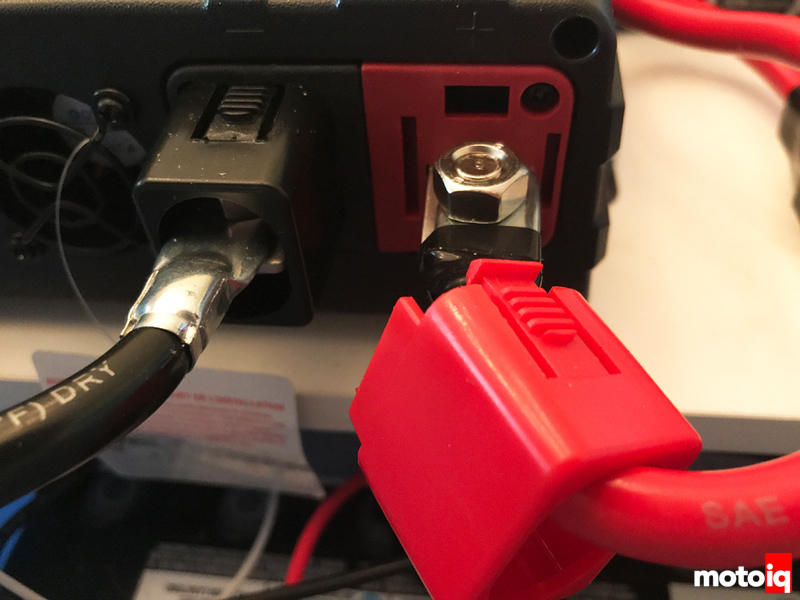 This article is going to show you how to make your own DIY backup power supply that is more powerful than most off the shelf units intended for small consumer orientated tasks. We wanted a short-term solution that would yield a significant amount of off-grid power for a day and, if your usage is not so significant, maybe up to a week. Of course a portable gas-powered generator is a great solution, but there are times when that may not be ideal. Or perhaps you simply want something different. In fact, add in some solar panels and that day to week range may be extended almost indefinitely. You could truly make this an off grid system. There has been more than one occasion at the track that when we have wanted to power electric equipment. Once we got a Honda 2000W generator that solved a lot of those problems, but sometimes being a good neighbor means not running a generator. We also had another issue that was pushing me to find a solution outside of a generator. You know from the article on the DIY toddler’s wheelchair that our grandson has spinal muscular atrophy which is a challenging medical condition. He is doing quite well and is an absolute gift, but camping has been a challenge due to his medical equipment not having the battery power to sustain a whole day let alone an overnight excursion. Another concern is a simple power outage at home. For most people they usually BBQ, go out for supper, and then use flashlights or just put out some candles and wait it out, but that is not possible with a medically fragile child who needs their equipment running. Plus you cannot run a generator all night without risking the ire of everyone within hearing distance. In fact, most campgrounds have significant limitations on when you can actually run a generator. The price tag of off the shelf solutions scared me so, with the help of others plus the internet, here is my alternative power source. 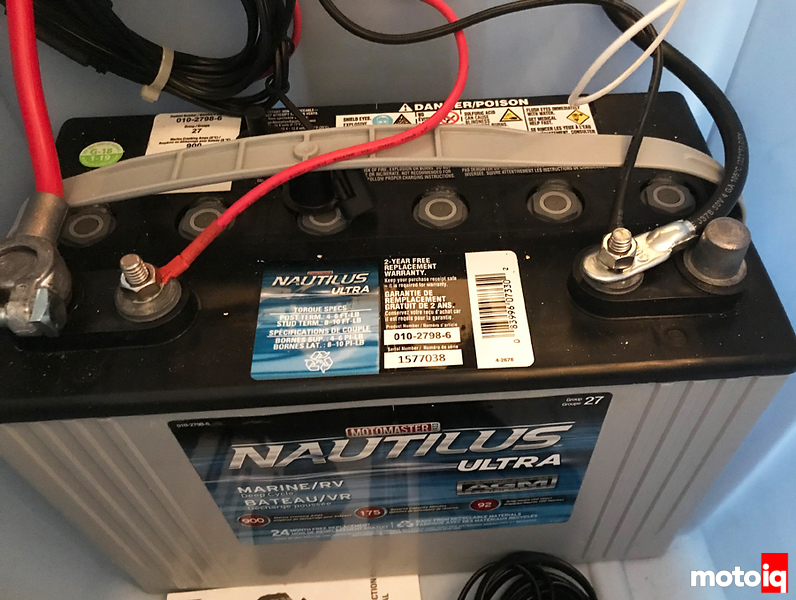 We are using a single Group 27 deep cell marine/RV battery. Should more staying power be required than this single battery unit, we can add a second battery and create a two battery array. One battery weighs about 60 pounds – this is not something you can easily carry around. The very light gauge wires are from the battery tender that ensures our battery is always ready for action. This inverter came with these awesome terminal covers. Unfortunately, they do not extend far enough to cover the cables that we purchased. Electrical tape to the rescue. Why didn’t you use a lithium ion Car battery for a light weight solution? Why not put everything on a movers dolly so you can wheel it around easier? Why not use an lithium ion car battery instead of the heavy deep cycle battery? Couldn’t you put the bin on top of a movers dolly to more easier roll the thing around instead of trying to carry it? Great questions. The idea behind a deep cell battery is that it can handle the repeated draining and charging required in a setting like this. A Group 27 lithium ion battery, similar in capacity to the Group 27 battery used here, would cut the weight in half as they are just under 30 pounds. However, they cost in the neighbourhood of $1000 which is FIVE times the price of the battery used. Our choice was the best price to power ratio. A car battery is designed to provide a huge burst of power for a short time and then be recharged by the alternator. Drain it frequently and it’s life will be shortened. A deep cell battery is designed to provide steady current over a long period of time; drained right down without shortening their lifespan. It will not work well to start your engine as it doesn’t have the cranking power. The Group 27 is a large and obviously heavy battery and was specifically chosen for the lifespan and amount of ongoing power it would provide at the expense of weight. We knew it wouldn’t be portable. As mentioned in the article on page 3, we will be getting some castors for the case so that it can be rolled about more efficiently. You mentioned solar panels. How would one go about hooking this up to solar? My son had SMA and we’d like to take him places next summer. This with solar would be perfect. Hi Mike, I don’t know a lot about solar power but it appears to me that many solar panels have the ability to charge batteries. I will be looking into this more eventually. Sorry I cannot give you more substantial answers but I just haven’t set this up myself.